Such a beautiful color that visually POPS in any dish to entice your visual senses! Truth is . . . I’ll take a red pepper any time over a green pepper since I’ve come to love their sweet taste! Oh, and not to mention how healthy they are for us! Tasty and healthy? Seriously? You’ve got both with red peppers! Our gardens are overflowing with perfectly vine-ripened peppers now in a variety of colors of yellow, red and green. So too are all of the farmers’ markets and grocery stores. So when peppers are in their peak season, head out to your garden or local farmers market and fill up a basket! Prices are still a bit high at this time for red peppers in stores nation-wide, so that’s one more reason to remember to get that garden going next spring with some pepper plants included if possible. Even if you have just ONE little window box . . . get something GROWING! Go beyond tossing these ruby babies in salads . . . give them a quick and hot roast . . . either in your oven (like I do) or on the grill (like my husband does . . . sorry, I can’t grill; I’m just too scared of blowing things up)! 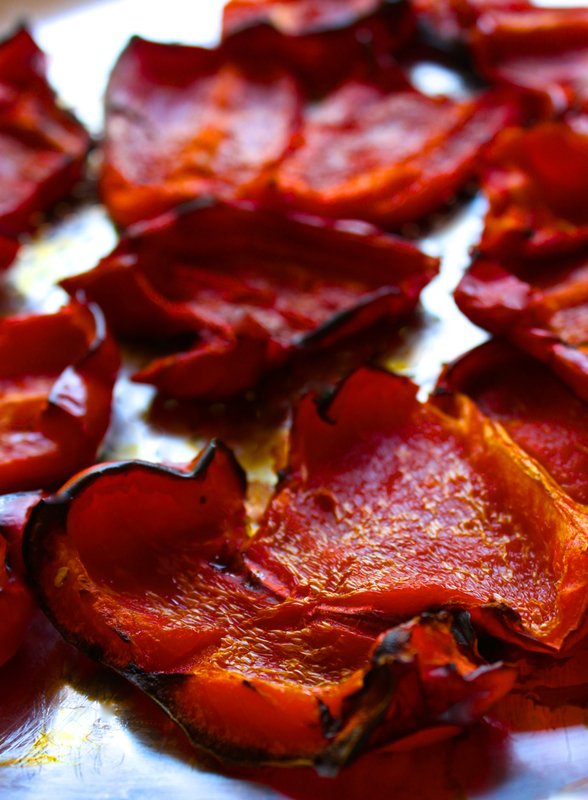 Roasting red peppers is a super easy way to let these red beauties SHINE with an intensified flavor, a hint of smokiness, and a delicate tenderness beyond compare! Purchasing roasted red peppers in jars is so expensive and the amount of peppers from just one plant is so much more affordable for us to harvest and roast by ourselves. Roasted red peppers do really well in the freezer . . . much less work than canning them! 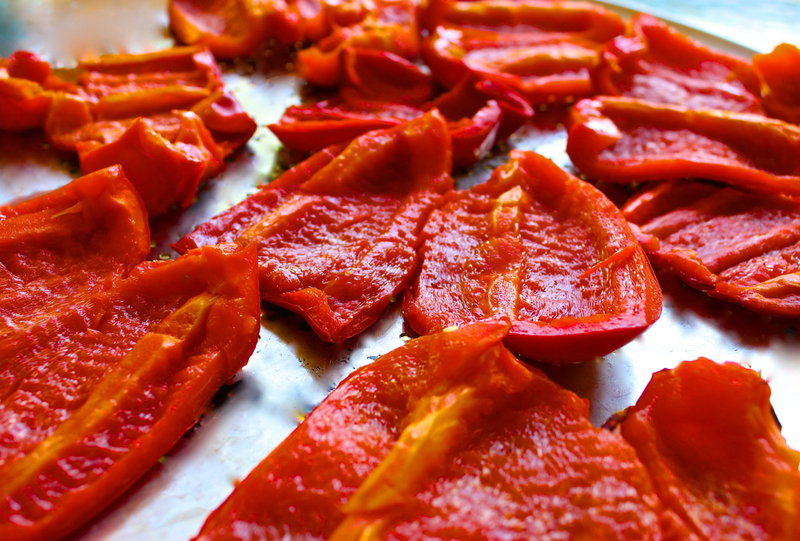 The simplest way to roast red peppers is in your very own oven spread out on a large baking sheet. FIRST, get that oven of yours set at the hottest temperature that it can possibly get . . . 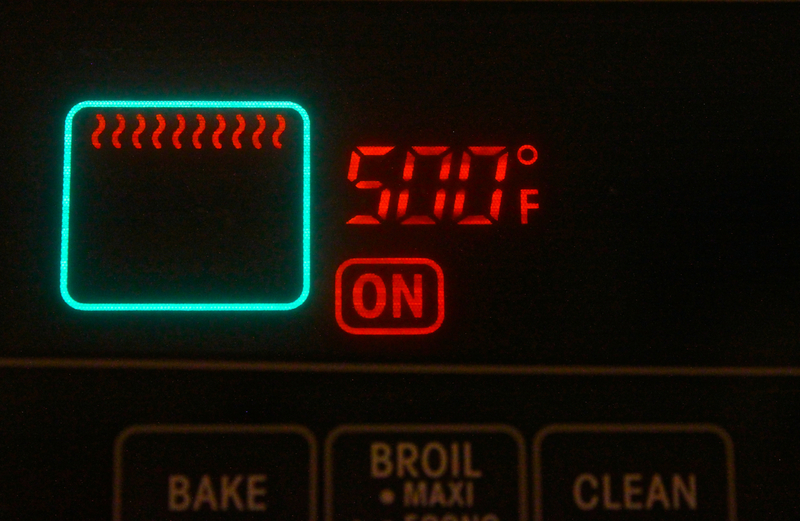 I set my oven at “Broil” which is 500 degrees F! set your oven on BROIL or on the hottest temperature that your oven allows! 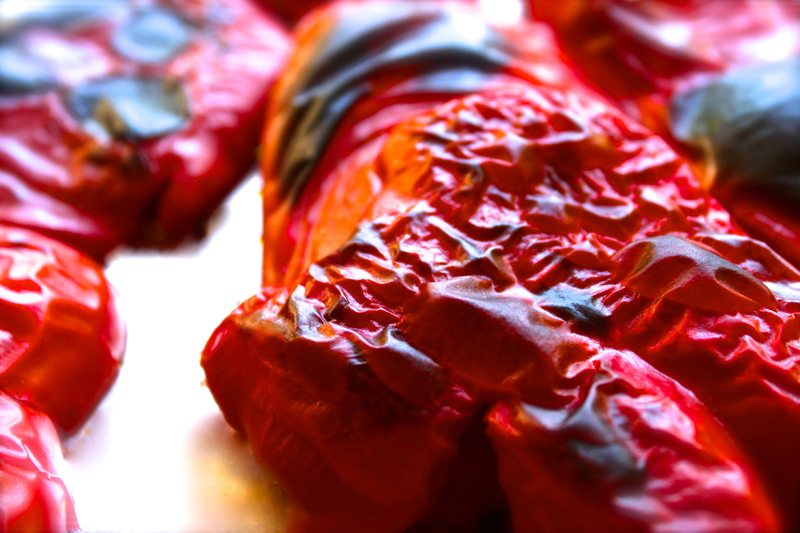 Roast the red peppers until the skins begin to blister and have a blackened char. After the roasting is finished, while the peppers are still hot, place the charred red peppers in a bowl and cover with some plastic wrap. You can also use a sealed plastic container. By doing this, the peppers are steamed a bit while they cool. After your peppers have cooled off enough for you to handle with your hands, you can either peel off the blackened skins or leave them on (I do this both ways). If you choose to leave the skins on, you can also easily slip them off after thawing the peppers from their freeze. In small freezer ziplock bags, place two pepper halves in each bag. I pack them this way because I only use a few roasted red peppers at a time. This way I can just go to the freezer and take out a bag as I need them instead of thawing out a whole bunch of peppers at a time when I don’t need that many. But it is totally up to you. Heat oven to broil or hottest setting. Place pepper halves flat, skin side up, on a baking sheet or pizza pan. Roast until the peppers are blackened and charred. 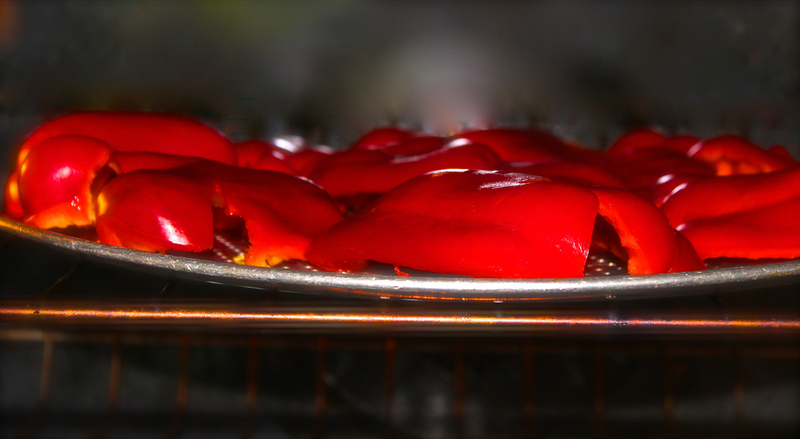 Remove peppers from the oven and flip them over to roast the opposite side (optional). When edges blacken, remove the peppers from the oven. Place the roasted peppers in a bowl and cover. Allow the peppers to cool. 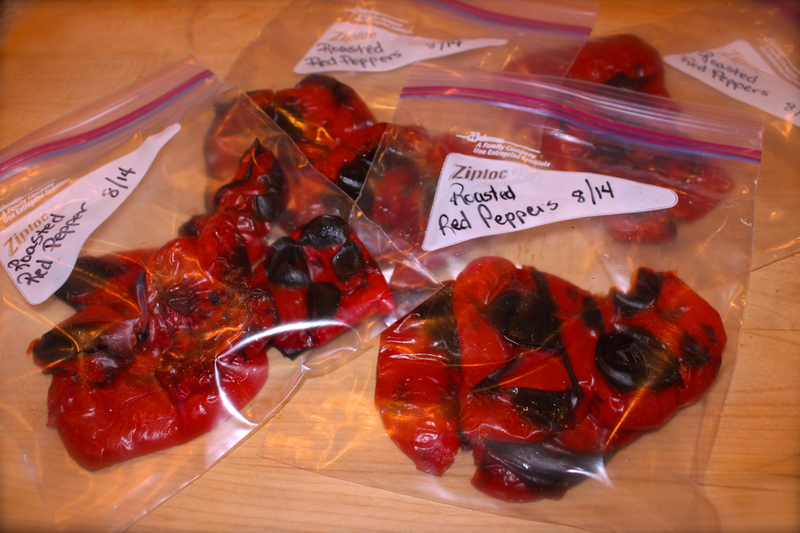 Place 2 red pepper halves in one small freezer ziplock bags. Continue to fill ziplock bags until finished. Place the bags of roasted peppers in the freezer. Have fun Roasting and Freezing Your Red Peppers! Thanks Liz, I like the edges charred, plus the peppers are less ‘mushy’ when you do both sides. I’ll look forward to reading your post! I like back-to-basics posts like this. Thanks for this wonderful tutorial, Roz. Oh Angie, thanks so much! Sometimes it’s the little things that will help others learn about cooking and some things sound so intimidating, when in fact, they are amazingly easy! Great step by step tutorial Roz. This is the best method in my opinion to roast peppers. I also prefer red peppers to the green ones. Now you will have a visual feast of red in your freezer all winter. I never thought about freezing my roasted peppers. Love the idea. I’ve never grown bell peppers before. Are they a finicky plant? I currently have rosemary, with baby rosemary clippings rooting in a mason jar on my windowsill, and an avocado pit that I’m impatiently waiting to root. Believe me, once you start roasting and freezing peppers, you’ll be so glad that you did . . . the convenience and savings is wonderful! I’ve roasted a ton of peppers but I’ve roasted and then eaten, never frozen. I don’t know why I never thought they’d freeze well. I’m converted!! Thanks for stopping by; I’ve been sort of MIA since classes have started back up this fall. Freezing peppers is just so much more convenient and cost-saving! Those are simply delicious! Thank you for sharing! Thank you so much Clotilde! I’ll stop by your blog in a moment. I always bring home a bushel of these babies in late August to roast and freeze. Will be doing that soon. Easy-to-follow tutorial! Thanks Claudia! I go through these peppers so fast, that it’s time to get more since my garden is pretty done for the year! Hope you’re doing well! 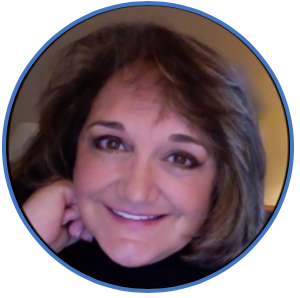 I loved this post, Roz! I have never roasted bell peppers before. I would like to give this a try and then make your roasted red pepper sauce. I can’t believe how beautiful and big the bell peppers are that came out of your garden! They are so beautiful. We haven’t been able to get them to grow very well here.They always come out really tiny. I don’t know if it is Arizona or just that we don’t know what we’re doing (a good possibility)! :) Thanks for a great tutorial! I know that gardening is challenging in different places and it sure wasn’t easy getting started here. We were so used to the rich soil in Iowa and then when we moved here, we had to put tons of amending stuff into the clay soil for anything to grow. I don’t know how peppers do in Arizona, I’m sorry. I was a horrible vegetable gardener in Phoenix, just horrible! But I miss so much of AZ that we don’t have here! Do you ever put any seasoning on the peppers before roasting? Look at ALL of those bell peppers!!!! I’m so jealous! Mine are just starting to grow. Can’t wait to have enough to roast. I usually roast mine on the grill so I don’t heat up the house. I don’t have air conditioning. 🙂 Everyone should do this. It’s so wonderful pulling these beauties from the freezer in the middle of winter. Great post Roz! Hey Roz! Afraid of the bbq…not you, surely? We use the Weber chimney to do ours. That thing you do the coals in before putting them in the barbecue. Once the coals are hot and before turning them out into the barbecue…works like a charm! I have found that when I do the peppers in the oven they get a little too cooked but maybe that was my old stove! Also…I freeze them separately on a piece of wax paper on a rimmed baking sheet then pack them into freezer bags. Roasted peppers and a big deal in our house and there is absolutely no comparison to the ones in a jar! I actually grew red peppers this year, so I wasn’t sure if I would have any left over. But they did well and I will try this so we can enjoy them later! 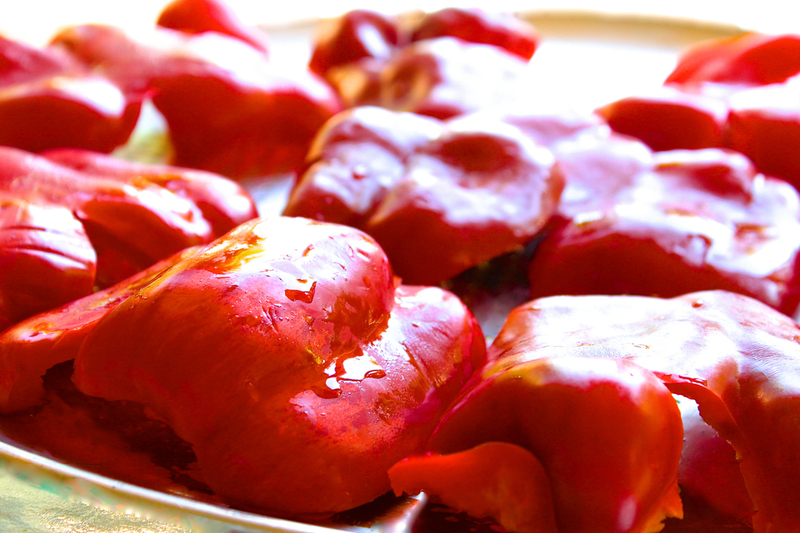 Can this roasted pepper be preserved by using refrigerator of pickling with olive oil? Should we put additional quart bags to a one-gallon bag? Since this technique can enhance the bag to become more freezer-safe. I am sure that if you add a little olive oil, it wouldn’t hurt the peppers. Either way they are going to come out of the frozen state somewhat soft anyway. I think that your idea of placing them in quart bags and then insert those inside a one-gallon bag is BRILLIANT and I’m certainly going to borrow your idea. I get very upset with freezer-burned food due to the waste of time and money, but I use my roasted peppers up very quickly and have never had to be concerned about freezer-burn. But, WOW, what a great idea! Thanks for the inspiration!